Isaac Newton is one of the most celebrated and recognized mathematicians and physicists in world history. 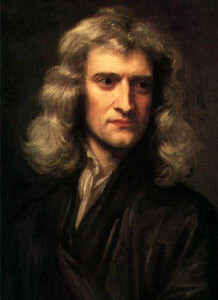 Known for his discovery of gravity, Newton remains to this day a very influential figure from the Age of Enlightenment. Isaac Newton was born in Lincolnshire on Christmas Day of 1642. His father died before Newton was born and his mother remarried. Newton’s early years were spent with his maternal grandmother. The time he did spend with his mother was very tumultuous since he did not like his stepfather at all. Until he was 17 years old, Newton was a student at The King’s School in Grantham. He did not leave the school on pleasant terms. Reunited with his mother, Newton tried his hand at being a farmer. This was a very unhappy with his new profession and he would re-enroll in school. Newton became a standout in school and scored very high in his studies. Newton became a student at Trinity College in Cambridge where he studied the official curriculum based on Aristotle. He also expanded his learning to include the study of the great philosopher – René Descartes. He invested a great deal of time pursuing his love for astronomy and he spent time learning about the lives and work of many famous astronomers. One of Newton’s best known early achievements while in school was his discovery of the generalized binomial theorem. This theorem set the stage for an expanded mathematical system which would be advanced calculus. Ironically, he was not considered all that great of a student when he was enrolled in college. When he graduated, he invested a great deal of time in self-study. During this period of self-study, he focused on physics, calculus, and the laws of gravity. Newton went on to publish a very influential work titled The Principia and it centered on infinitesimal calculus in geometric form. His work on cubicle curves in relation to the Euclidean plane was quite revolutionary for its time. As with his other studies, the work set the stage for amazing inroads in math and science when others built upon the groundwork he created. Newton made many discoveries in areas related to optics, the theory of finite differences, and innovative applications in geometry. Based on his very unique work, he received a great deal of acclaim. This led to him being named Lucasian Professor of Mathematics in 1669. Traditionally, a person who was awarded such a position had to become a priest. Newton was given an exemption from that rule. In his later years, Newton invested a significant amount of time writing about the subject of religion and he even studied alchemy. Financial hardships, however, plagued him later in life. Newton passed away on March 20, 1727. He died unmarried and had no children.